Jane McGonigal, the game designer and author of the best-seller Reality is Broken: Why Games Make Us Better and How They Can Change the World gave a wonderful keynote called Higher Education is a Massively Multiplayer Game. She sees and advocates the incorporation of gaming as possible future for higher education, saying that over one billion people now play games for at least an hour per day. Some people are so committed that they play games like it is their job. Apparently games bring us 10 positive emotions: joy, relief, love, surprise, pride, curiosity, excitement, awe/wonder, contentment and creativity. Games also provide an environment in which it is safe to fail and easy to learn from one’s mistakes. She also showed some neurological research scans of brains from Stanford that showed the difference between active and passive brains. They were most active when engaged in a game. She said that Play was not the opposite of work, it was the opposite of Depression. 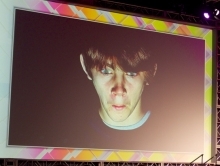 Apparently, gaming activates the same part of the brain as a cocaine addiction. It encourages: the mastery of a skill, solving puzzles, driving personal ambition, motivation, the anticipation of rewards, practicing habits, determination and further skill development. She urged educators to super empower learners about their own ability to succeed in learning by using things like points to complete missions, badges for development of new skills – anything that gives learners a meaningful goal and recognises their achievement. What could be done with a billion gamers on connected devices? What could they do together? I don’t think education is about centralized instruction anymore. Rather it is the process of establishing oneself as a node in a broad network of distributed creativity. And those thoughts beautifully flowed on from the sentiments expressed earlier by both Ken Robinson and Mimi Ito. Foldit, from the University of Washington teaches protein folding, building on the fact that manipulation by participants in the virtual space was better than that of super computers because gamers were more skillful and possessed of better spatial intelligence. They knew not to apply brute force. Soon after an invitation to join the project was published in Nature, gamers solved in three weeks a problem with HIV/AIDS that had baffled scientists for over 10 years. Evoke (based on Grand Theft Auto?) is a project that helps solve social problems with young people becoming super heroes for the rest of the world. It focussed on youth at university age in Sub-Saharan Africa as a source of solutions not just problems. The aim is to solve real-world problems by making the best use of youth skills and with their collaborators and allies. Blogs, photos and videos were uploaded to prove progress. The World Bank Institute (WBI) provided Social Innovator badges and it resulted in 20,000 students being enrolled from 130 countries. They accidentally ran a MOOC! 50 new social enterprises were funded by the WBI like Libraries Across Africa (now Librii) : a franchise model that is up and running in Ghana now. Find the Future is a game that Jane helped to create for the New York Public Library (NYPL) Centennial in 2011. It kicked off with an overnight event that offered 500 places for players (18 and over) to explore the NYPL’s collections for clues locked away in 100 objects that changed history. They had 10,000 applicants. Together the participants put together a collection of stories over night for the NYPL’s rare book collection. Jane believes the future of education is in a blended environment of gaming, something like MOOCs and live events that allow learners new ways of learning through creative practice anytime, anywhere and in collaboration with others. Professor Mimi Ito from UC Irvine is a Cultural Anthropologist. This was a great follow-up to Ken Robinson’s keynote. She talked about adapting educational technology in the 21st century to platforms that can connect classrooms to a wider world of learning. For middle school kids those technologies centre around games like Minecraft and media sources like YouTube. Education lags behind changes outside the classroom. It needs to move towards open networks that: increase the amount of information that is available; are production oriented; solve problems; include civic engagement; and are inquiry based. We are not there yet. To tap the potential we need to forge stronger connections between classrooms and the world at large. Education needs to be seamless with life itself. Technology can be a powerful ally for this agenda. Younger people are more avid readers – in all forms. And they average 7.5 hrs per day in media consumption (it is saturated). Gaming is the entertainment media of our time – at all levels of society. Abundance (of options, availability, continual connection, etc. ), however, can also be too much of a good thing. What do they do & learn? Heaps! Baseline technical literacy and to be a social being. Uploading photos, managing web pages, managing profiles, interacting, judging, etc. Some online tools really allow people to do amazing things, such as uploading to YouTube channels for civic causes. Some users are really out there, but they are a minority. At the other end of the spectrum there are the bullies. She quoted GIbson: the future is already here, just not evenly distributed. She then went on to distinguish between Friendship-driven & Interest-driven participation. This started with MySpace and Instant Messaging and is now based around Facebook and Texting (or other fast ephemeral services like Snapchat and Kik). Dorks and geeks can connect with others who have shared interests and share knowledge and expertise – so that is very different to a friendship group. She used the example of Facebook being used to connect with those you went to school with and Tumblr (or Instagram) being used for those you wish you went to school with. So FB is more about friendship (with kids seeing adults there as just creepy) and Tumblr (& the like) is more about interests. It is now easy to find and connect to an online community that is very different to the one in which you live: communities of producers with like interests. It allows and facilitates the development of potential for those resourceful enough to take/absorb/use from their peers and interest groups and then apply it in an academic community. She warned though that only a few do this. Mimi said the academic bubble now has to reach out and facilitate those connections. To overcome the cultural gaps they face young people still need and look for adult support and guidance. She warned that some tools can also become “weapons of mass distraction”. Attention cannot be controlled the ways we used to. We need to more creatively deal with a culture or environment of media abundance. And we don’t want to go back to an environment of scarcity. Quoting Howard Rheingold in NetSmart she says we need strategies to cope with abundance and distractions such as: crap detection; attention management; collaboration; participation; net know-how; etc. Referring to Open Education Resources (and MOOCs?) she said that the build-it-and-they-will-come attitude tends to re-advantage those already advantaged and only serves to widen the gap. Access is not enough. She used a three-circle diagram to show that Connected Learning happens at the intersection of three communities: Interests; peer culture; and the academy. She described communities on Google+ as connected learning. BUT: beware of putting a pop-culture veneer on something that not so pleasant, which she described as “chocolate coating broccoli”. Actually, I don’t mind broccoli; I am sure she meant to say cauliflower. Finishing up, she reminded us that the major challenge in all of this was in getting faculty/teachers/academics on board, not so much the students. 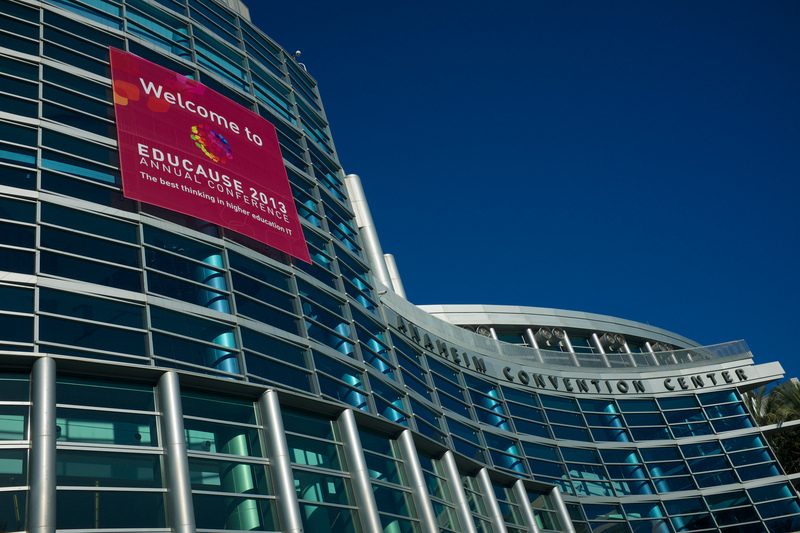 I was lucky enough to attend Educause 2013 in Anaheim, California in October. I had one arm in a sling after a fall that dislocated my left shoulder, but I took handwritten notes in a notebook and on looking back, some of the sessions I attended had some interesting and stimulating content, so I might do a few posts about the best sessions. This first post is about the keynote that opened the conference by Ken Robinson, the English author, speaker and adviser on education. He started quoting lots of famous people like Asquith, Churchill and even Dorothy Parker. All very amusing and entertaining. My favourite (as a lapsed economist) was the J.K. Galbraith quote: The only function of economic forecasting is to make astrology look respectable. Then he focussed on the way we are as a species and the all pervasive effects of cultural norms on our behaviour. He said that some technologies, like TV for example can change that. I liked his reminder that when Apple first introduced the iPhone in 2007(?) it had something like 800 apps. Now it has over 800,000 and that is well beyond what Apple would have designed themselves or even imagined/anticipated. It is a great example of people appropriating a brilliant idea and then seeing what they can do with it. He then moved on to talk about imagination, creativity and innovation. He described Imagination as giving us the power of Creativity, which is a process in which you do something or make something. Innovation is putting good ideas into practice. I think there is a lot in this for future libraries: stimulating and inspiring imagination, then providing spaces, technologies, services that allow people to make things (not just write about them) and also assisting in bringing people together to put those great ideas into practice. Ken said we are constantly evolving and modern technology enabled us to do things now that were not even possible before it was introduced. Sometimes it also allows us to imagine possibilities well beyond what we can now do. He warned that even though there has been so much technological innovation in the last 10 years, IT in education seems to have blockaded against it. (Unfortunately, this was further illustrated by many sessions in the conference that concentrated on controlling ICT from within and defending against all boarders or potenial collaborators from outside our institutions.) He went on to say that technology isn’t over now, it is never over and that the future will involve even more profound changes than we have already seen. He then postulated about the rights of robots in the future. I think he mentioned that now you don’t even need to go to the library to access information, so it has to develop another role and embrace the technologies that gives it new purpose. His next topic was the lack of a sustainable rate for consumption (by humanity). The planet will survive and so too will bacteria, but humanity is now at risk. We need to challenge what we now take for granted. For example a university degree no longer assures you of a job for life. For humans, life is not so linear or manufactured and we must think differently about ourselves to become more organic and creative. Creative education depends on different kinds of questions in which there is no correct answer. I doubt that the current obsession with big data collection and analysis will help us much in this quest. Currently we think in terms of improving old policies rather than looking at new systems.